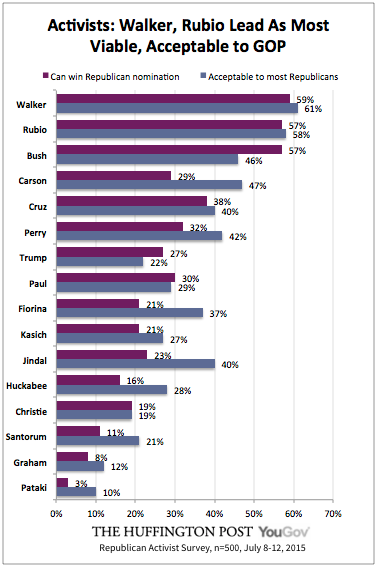 A new poll from The Huffington Post and YouGov puts the Republican presidential candidates in perspective. With no real grassroots network on the ground, email strategy or campaign staff social media presence, some are beginning to wonder if Donald Trump is just a media phenomenon. This new poll seems to suggest that Republican voters are more focused on candidates with serious strategies and effective grassroots campaigns. The poll does show a clear top tier of candidates currently perceived as both worthy of support and electable by the activists. By those measures, Walker and Florida Sen. Marco Rubio currently stand well above their rivals. Walker earns a few superlatives. Alone among the candidates, he’s viewed “very favorably” by more than half of the activists surveyed. Just 5 percent say they wouldn’t back him under any circumstances. He’s also seen as the kind of candidate who could build a strong consensus: 61 percent of activists believe Walker would be acceptable to most Republicans, and 59 percent think he’s capable of winning the Republican nomination. Fifty-five percent think he’s also capable of going on to win in November. Rubio also outscores most of the Republican field on those measures, rating just below Walker. Forty-eight percent view him very favorably, and 58 percent think he’d be acceptable to most Republicans; 57 percent and 51 percent, respectively, say he could win the nomination and the general election. Only 8 percent say they’d never consider voting for him. Walker and Rubio stand alone in their perceived viability in November, with activists holding little confidence in any of their rivals’ ability to win the general election. Although former Florida Gov. Jeb Bush matches Walker and Rubio in his perceived ability to win the nomination, just 39 percent think Bush can win in November. Fewer than a third of the activists think any other candidate would be able to do so.